California cannot meet its greenhouse gas reduction targets without increasing density in already-developed cities, according to a recent analysis by the LA Times, the California Air Resources Board, and BuildZoom. The state is committed to reducing greenhouse gas emissions 40% below 1990 levels by 2030. Based on CARB’s scoping plan, the LA Times estimates that in order to accomplish this goal, Southern Californians will need to cut their driving from 22.8 to 20.2 miles per day. Unfortunately, California’s urban planning policies and restrictive zoning regulations present a major barrier to achieving these goals. As demonstrated by Issi Romem of BuildZoom, cities in California and throughout the United States concentrate their new housing development in low-density areas or by expanding into undeveloped regions. This pattern of low-density development increases the amount of driving required to get to work or conduct simple errands. Higher density in California is possible. San Francisco has a population of 865,000, while Paris, a city with a smaller area (41 square miles compared to SF’s 47 square miles) houses 2.22 million souls. 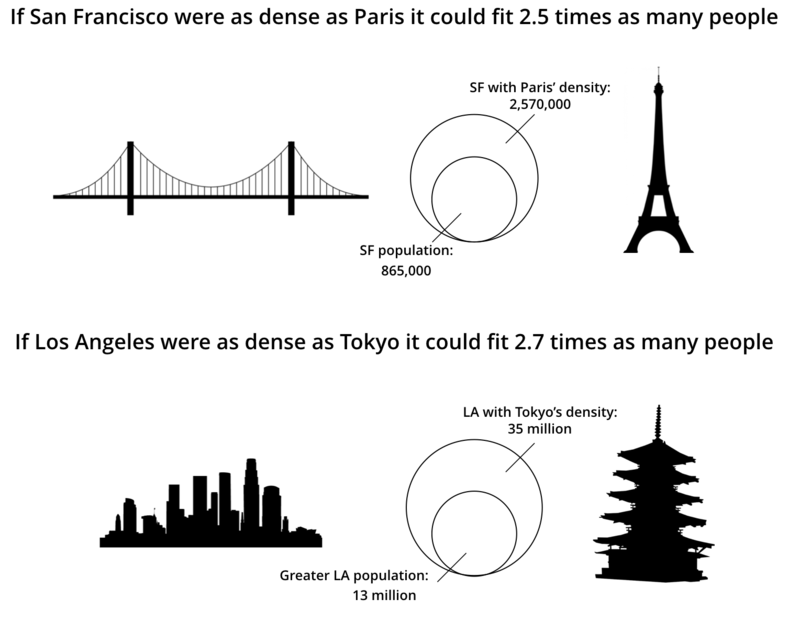 If San Francisco had the same population density as Paris, then SF could support a population of 2.57 million. Los Angeles has a population just under four million, but if it had the density of London, LA could support 6.7 million people. The Los Angeles Metropolitan Area houses nearly 13 million people, but if the region had the same density as the slightly larger Greater Tokyo Area, it would hold about 35 million people. The benefits of relaxing zoning rules to allow greater density would go well beyond reducing greenhouse gases. A lack of supply is a major reason that many housing markets, especially in the San Francisco Bay Area, have gotten so expensive. Ed Glaeser and Joe Gyourko have found a median house price in San Francisco of $800,000, but absent restrictions it could be about $280,000. 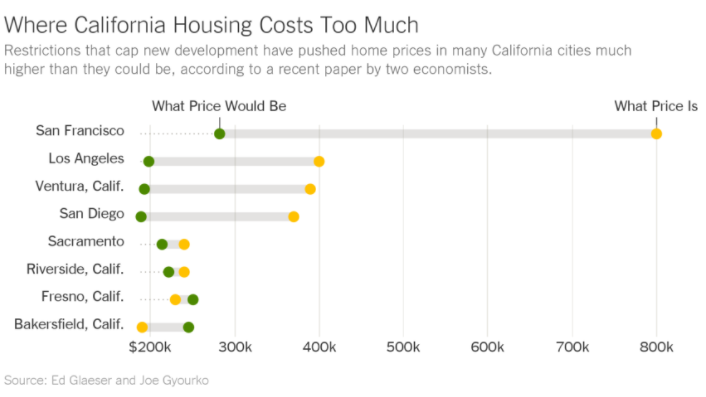 In Los Angeles, median house prices are $400,000 but could be about $200,000. As noted in An Ecomodernist Manifesto and Nature Unbound, dense cities represent an important pathway towards intensifying human economic activity, using fewer resources, and reducing pollution. And as agricultural modernization proceeds around the world, labor forces tend to shift from the farm to industry and services, which concentrate in cities. That’s why over 70% of humanity is projected to live in urban areas by 2050. Obviously, large portions of humanity will remain outside of cities. But if these trends are any indication, it is clear that bad policies prevent millions of people from living where they want to live. The aggregate effect increases the human footprint, both geographic and atmospheric. Michael Goff was an Energy Analyst at Breakthrough 2016-2018.